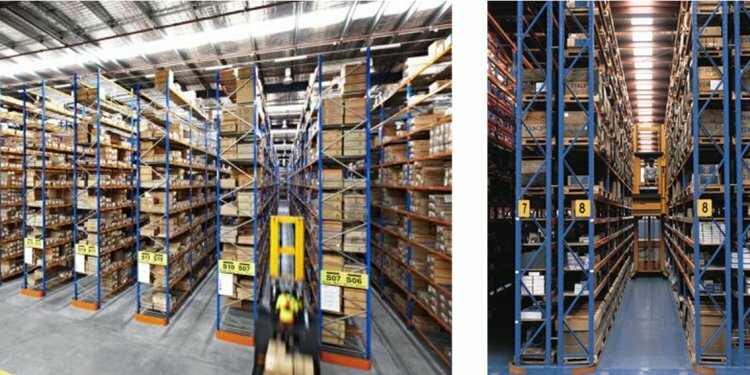 A major problem within the Australian logistics and warehousing industry continues to be a lack of sufficient storage space. With commercial property prices continuing to increase for both purchasing and renting, companies are looking to alternative solutions to increase available storage space. Australia’s continued growth in e-commerce as a method of purchasing has also contributed to the lack of available storage space as companies need to bulk order larger quantities of popular items to meet demand. This blog post will look at two alternative materials handling solutions, which can dramatically increase the amount of storage space available. The first option is the use of narrow aisle forklifts. The Aisle-Master narrow aisle forklift available from Adaptalift Hyster is an industry leading solution. Due to the ingenious articulated design the forks of an Aisle-Master forklift are able to rotate a full 180 degrees to move materials from racking whilst the body and counter-balance of the forklift remain stationary. The ability that allows only the tines to move means that warehouse racking doesn’t need to be widely spaced to accommodate a larger counterbalance forklift. Due to the Aisle-Master’s ability to operate in smaller racking aisles, companies are able to fit more racking into their warehouses offering extra space for more storage. The Aisle-Master is available in two different LPG models with a maximum capacity of 2, 000kg, with maximum lift heights ranging from 9, 050mm to 12, 400mm. For warehousing situations where a large forklift is not required Adaptalift Hyster has a range of hand held pallet jacks and walkie stackers from Liftstar. These units are equipped with a unique feature called Aisle-Assist. Aisle-Assist provides greater operator safety by allowing operators to view tynes unimpeded when lifting loads, providing more convenient and efficient working conditions for operators. We hope this blog post has been useful showing you some of the specialised materials handling equipment out there designed to increase storage space and improve operator working conditions. Adaptalift Hyster are experts in designing full turnkey materials handling solutions, that allows companies to fully maximise available space without compromising on safety, productivity and affordability.